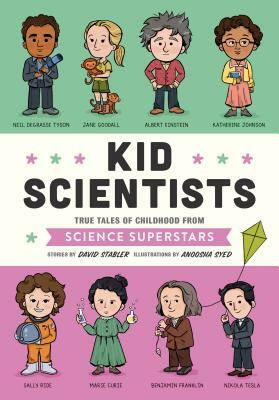 Funny and totally true childhood biographies and full-color illustrations tell tales from the challenging yet defining growing-up years of Albert Einstein, Jane Goodall, Marie Curie, and 12 other brilliant scientists. Every great scientist started out as a kid. Before their experiments, inventions, and discoveries that changed the world, the world's most celebrated scientists had regular-kid problems just like you. Stephen Hawking hated school, and preferred to spend his free time building model airplanes, inventing board games, and even building his own computer. Jane Goodall got in trouble for bringing worms and snails into her house. And Neil deGrasse Tyson had to start a dog-walking business to save up money to buy a telescope. Kid Scientists tells the stories of a diverse and inclusive group—also including Temple Grandin, Nikola Tesla, Ada Lovelace, Benjamin Franklin, Isaac Newton, Rosalind Franklin, Sally Ride, Rachel Carson, George Washington Carver, and Vera Rubin—through kid-friendly texts and full-color cartoon illustrations on nearly every page. David Stabler is the author of Kid Presidents (Quirk, 2014), Kid Athletes (Quirk, 2015), Kid Artists (Quirk, 2016), and Kid Authors (Quirk, 2017). He Lives in New York City. Anoosha Syed is an illustrator and character designer for animation. She lives in Toronto.